1920 RUSSIA/ envelope sent from Vladivostok to Plzen, franked with overprint imperforated stamp, local issue for Vladivostok 10k/3.50R, Mi.16B with violet round cancel. "POLNI POSTA CESKO-SLOVENSKYCH VOJSK NA RUSI" used by Czechosl. Cosulate in Vladivostok; good condition, exp. 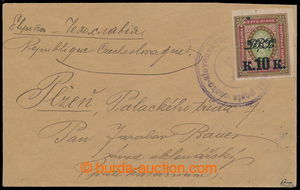 by Karasek., Pitt, rare letter!